Note nothing in these pictures is mine incase anyone gets confused. I can never seem to win the trays at some of the shows i go to and to come so close always makes things worst. 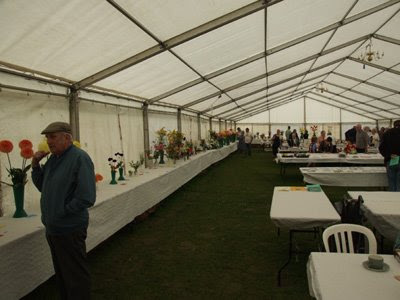 Before the judging began I already knew id lost the garden news tray, from experience you can judge just how many points your going to get and i was right. The collection of 6 on the other hand i thought i had due to my only real contender having very bad rust and i mean bad on his leeks, slight rot on the bottom of the celery and discoloration on the parsnip foliage tops. 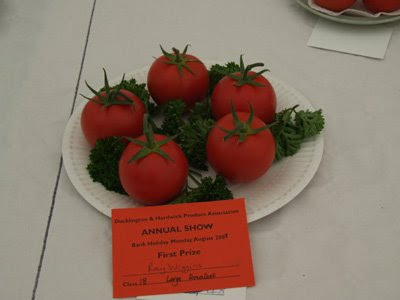 The judges dont actually pick the veg up at these shows for some unknown reason as they are always untouched when we come back in the exact same place. Not one to complain I'm happy with second and always respect my competitors and the judges. The nvs actually advised the winner who previously had rang them about showing leeks with rust to throw them away which really rubbed it in considering he won.. Never mind always next year, well done. One thing that was obvious despite my parsnips having a good 7 foot of room to grow down is that was no where near enough. The problem we had was they didnt have any where to go once they got to the bottom and the root didnt taper instead tried to force its way down even further. This resulted in lumpy ends, this is not due to the tail snapping off either as the pipes are lifted so the parsnips are not pulled, avoiding breaking any part of the parsnip. Despite this i only had to pull 6 parsnips to make a set of 4 with 5 being good and one with two tails right at the end. Next year I'm going to have to rethink as im pretty sure i could grow something very special but would require 9-10 foot of growing room. Despite the end of the parsnips they were pretty near perfect and I'm 100% sure i can grow them much longer than this and look forward to next years modifications. 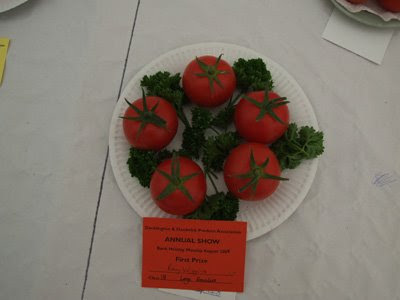 Well heres the results of my first show with a slide show of my veg that i entered. Slightly disappointed losing out on both trays by 2 points. On a better note i did pick up a second for my Winston potatoes which is my first ever card on potatoes. 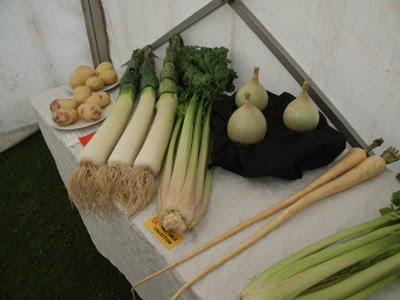 The big classes were heavily contested again this year by some top growers one of which shows at nationals but was impressed with my parsnips that came first. 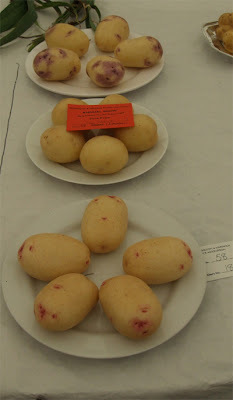 More on that later heres a quick slide show for now of my veg that i entered. 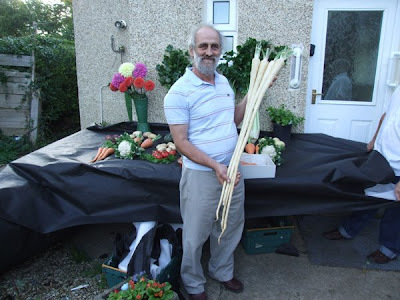 Exhibition leeks will not grow in england any more outside due to global warming with the constant rain. I will be removing one of my poly tunnels this year and replacing it with two large green houses. I hope to able to keep one warm during the winter costing me less than a tunnel would. I will use one as a cold frame and grow my tomatoes in both of them after that next season. I hope this will improve my constant battle with heat that builds up inside my tunnels as a greenhouse is more adjustable when it comes to ventilation. My leeks have all decided to discolour in the past week or so on the barrel which looks like a copper rusty mark that runs down the leek getting worst as you remove more flags. I think this may well be due to the amount of rain we have sitting in the flags and working its way down the barrel. The tunnel I remove from the garden will be replaced in the allotment and modified by myself with side vents and enviromesh. I hope this will keep them protected but cooler in the summer? if we have one!. I will be doing the same for the onions so the winter months will be a busy one and I will just have to see if I have time/money to do all this. I'm sure the Johns Innes compost is partly to blame for my problems with the foot rot I have had this year that I have never had using other types of compost. One problem being the amount of grit being added to the John Innes range, I have even found lumps of orange tile in the bag which can damage young leeks while growing. I already have a contact for trailer loads of eco compost to be delivered which will help bulk up my new raised beds in the greenhouses and the tunnels with 12 tonne of 25+ year old manure coming. My main aim next year is really to beat the weather and start growing at the same level as a few years ago when we had sunshine in summer, if this means growing everything inside so be it. Anyone showing at this time of year I wish you the best of luck and have fun!. Well i picked my long cucumber as i felt it was starting to jepodise the smaller ones that are coming on that i will require for the show in three weeks time. I'm sure this variety of cucumber would grow well over 24 inches with time. This one measures 20 inches and tasted fantastic even the skin was still soft. I will probably try and look to pick my cucumbers for show at around 17 inches long. Anyone wanting to try this variety next year its called "King George" and is quite common to find in the garden center (at least all of my local ones). I will probably get some seed at the end of the season so if you get stuck let me know. I have so many cauliflowers planted Id be amazed if I dont get any for showing this year. I have 3 tunnels planted up, one bed outside with another 2 to fill along with another 20 later ones going inside the tunnel this weekend. One problem I have had is caterpillars even after using deris dust in vast amounts to the point of people saying its snowing inside your tunnels. Tomatoes are ripening fast now and I might struggle to hold on to my best tomatoes at this rate. I have two tunnels full of them and even the later ones are turning red because of the heat. I have been picking marrows for about a month now and all have been of show quality so I hope to get quite a few decent marrows from here on. Yes any show masters out there will say "I should have picked that marrow off as they are to close" but I have so many I don't care and they look so pretty together I didnt have the heart. The celery that I'm growing in pots are coming along a lot better than I expected and it just shows you can grow some great veg in a pot. I admit these wont be as big as the celery that are growing in my raised bed which have caught these up, but still if your pushed for space or money it could be a life saver and I will certainly be showing some celery this year from these pots. These are now on 23 inch collars. There is a few veg that I dont really mention in my blog much, one being the cucumbers mainly because all you see is green leaves for months on end. Heres a cucumber I have left on to see how long they will get before they lose there quality. I always leave one on so I can judge what size I should be picking them at, any early cucumbers are picked off when they are small. Now is the right time to start leaving the cucumbers on for the shows and straightening young cucumbers.